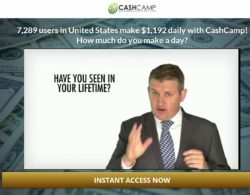 This review contains proofs about „CashCamp“ being a binary options scam. It is presented by Michael Solovsky. Solovsky claims to have a binary options trading software that can make you more than a thousand dollars per day. The software is called Cash Camp and it works on autopilot. You can get it for free. Let’s be honest, Michael Solovsky is not a binary options trader, at least not profitable. In fact he does not even exist, his role is played by a paid actor. The aim of Cash Camp is this: they need you to deposit at least $250 with their broker, because it will earn them an affiliate commission. It is why they will give you the software for free, it does not matter that it is losing money, they will earn their commission anyway. 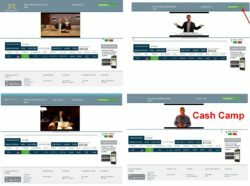 So if you don’t want to lose money, don’t trade with CashCamp. All the CashCamp testimonials you can see in the video are fake. They were made with paid actors. Look at the example on the right, you can hire this guy for a couple of bucks on Fiverr. Account statements and results of Cash Camp are fake too. You can see an example on this image. 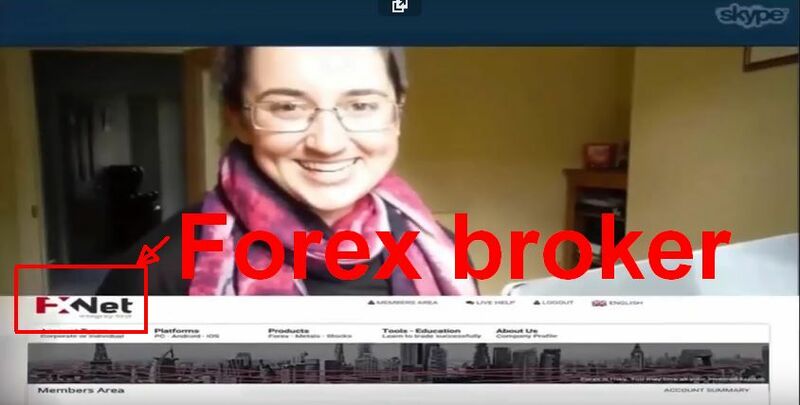 They show the web site of FXnet, which is a Forex broker, you cannot trade binary options with them. So the image has obviously been faked, it has nothing to do with real results of CashCamp. And finally the trading software used by CashCamp is a product of scammers. They use it with many scams, recently we have seen it in the Disrupt Trading scam for example. You can see on the image that a lot of scams use it, it starts with a fake trade that supposedly earns you money, but in fact it is fiction. The money is not real and your balance is in reality zero. CashCamp is an ordinary binary options scam that is here to take your money. So stay away from it. If you want to experience real binary options trading to see how you can really make money, try a free demo account. It takes time and learning to achieve profits in binary options trading. Hey John, keep up the good work; you are SUCH a breath of fresh air in this murky game and you are very much appreciated. Along with Binary Options Watchdog, OptionXE (who used to run Optionbot and Optionbot 2.0), another deliberately misleading BO review website (to add to the lengthening list) is Louis Harris’ Trusted Binary Reviews (trustedbinaryreviews.net) . Taking just one of his transgressions, Louis lauded Cash Camp from the skies (trustedbinaryreviews.net/cash-camp-review-scam/) – BTW he is very buddy-buddy with the OptionXE guys. 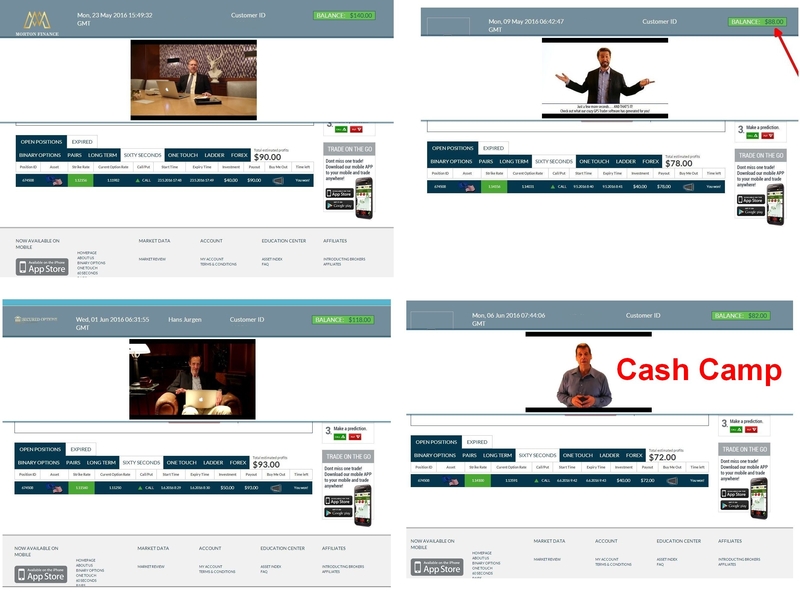 I and three fellow traders – friends of mine and like me pretty experienced Fx and BO traders) opened Cash Camp accounts before the summer (expecting Cash Camp to be a dud) and – surprise, surprise – it was a complete flop. I think it works either Ponzi style (successful early adopters comments on success are published while the comments of people who lose money are not published) or they just generate large numbers of fake testimonials – either way, quite dishonest. Anyway, I emailed Louis on three occasions using three different emails raising my suspicions and he responded to none. Likewise, any attempts to tell my story (that the manual trading signals were ITM at the rate of about 50% and this was following Louis’ advide as to how to trade to the letter, and the autotrader traded EUR/USD with hourly expiries at the top of the hour only and invariably at 1300GMT – the MOST dangerous time to trade in any day – you can guess my P and O from that) and that of my buddies in the comments box below Louis’ Cash Camp review went unpublished. These guys are laughably and despicably unscrupulous (and quite clever, they will pan large numbers of obvious dud trading applications to make it look as if they have cherry picked for you those one or two that are profitable, alas they are all duds) while relying solely on, what are probably highly significant affiliate returns. As you so often say, they ONLY way to profit is to take the time to learn to trade (and as way of a warning, Binaries are harder to learn than Forex). However, on YouTube there are a couple of really good guys who share their methods at no cost. A sign of really honest operators.